Volendrung is the only Daedric artifact you do not need to possess for the Oblivion Walker achievement/trophy, as the quest completes (and increments your total) while the hammer is transformed on the altar. In Arena, Daggerfall, and Oblivion, Volendrung had the ability to absorb health and paralyze opponents, but it was unenchanted in Morrowind. Guards will occasionally comment on the weapon if you have it equipped, saying "That is one... big hammer" or "What do you aim to do with that hammer, friend? Knock down a house?" 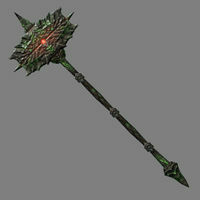 Despite its higher speed giving it an abnormally high DPS value, there are three base weapons that outdo it; the daedric battleaxe and the dragonbone greatsword and battleaxe. This issue has been addressed by the Unofficial Skyrim Special Edition Patch; It causes the weapon to benefit from the Dwarven Smithing perk.